Our new ADV campaign, discover perfection, has been published! All BDF Industries products are exclusively designed, made and tested by us. 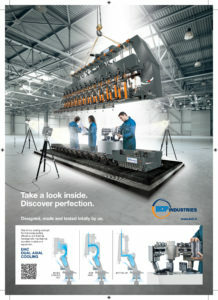 In this advertising campaign was promoted our well known DAC Cooling System. Stay tuned for new products advertised. Acquisition of ECS Numerical Control BDF INDUSTRIES secures furnace rebuilding at Glassforce, Aba Plant Nigeria.